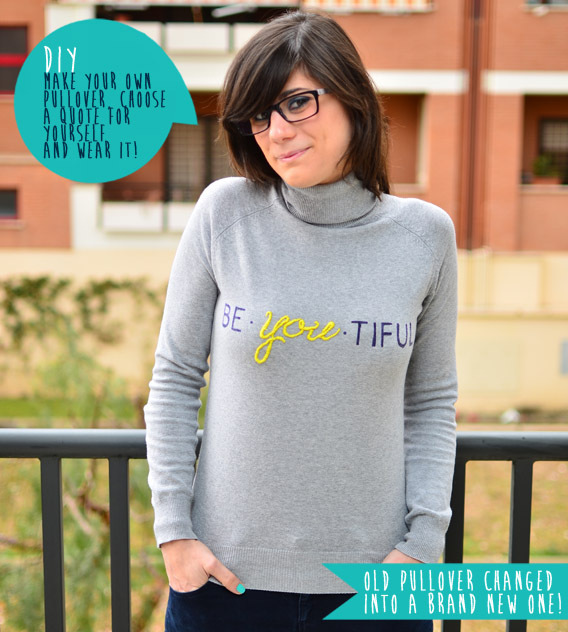 My Daytime Dreams: DIY - Old pullover changed into a brand new one! Hello everyone! Today I'm soooo excited because this is my first DIY project! 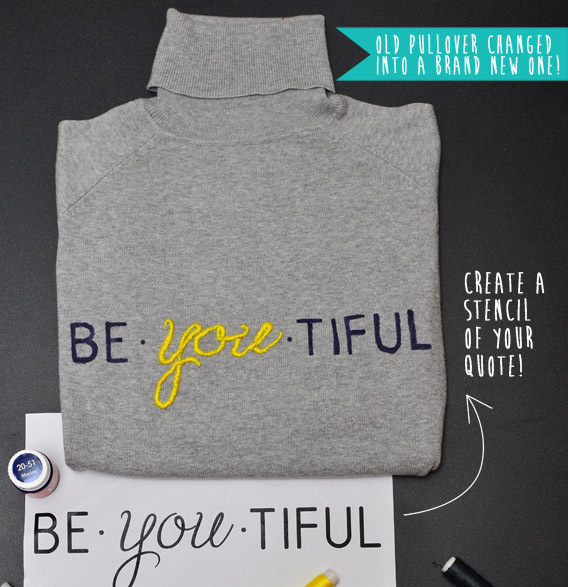 A few months ago I found an old gray pullover in the closet, I took it thinking "I have to give it a new look!". I really like changing old clothes into new ones to wear them again!It doesn't take much to give a new aspect to an old cloth, a little detail, a color refinement, a sewing patch or a wonderful quote. I've used this grey pullover but you can choose a cotton bag or even a simple T-shirt. I've chosen to apply a quote on my pullover because I think that this is also a way to communicate, for this reason the "motto" of this project will be "choose a quote and wear it"!! I really hope you'll enjoy the project. Good luck with your work! 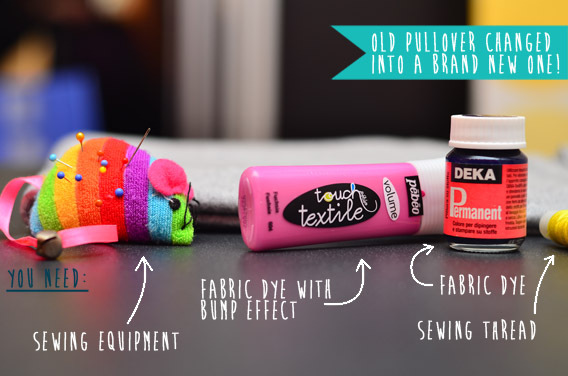 First, you need a shirt / sweater / bag, fabric dye (I chose a navy blue but you can choose any color), a fabric dye with bump effect to play up a part of the quote, a sewing thread (I've used a yellow one), and some common sewing equipment (needle and pins). The funniest part was choosing the quote. 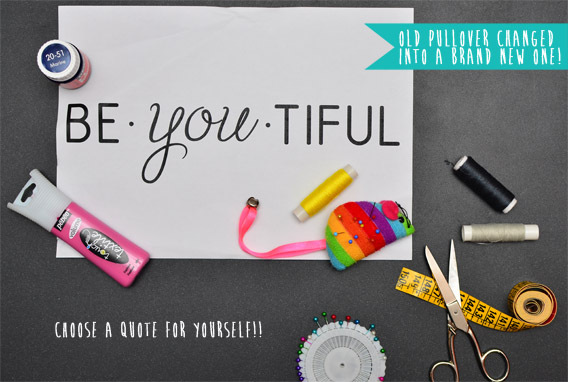 I wasn't sure about which quote to use for this project! In the end I've picked this one because sometimes I need to remind me and others that "being you" is the first step to be happy! Then I printed my quote and I created a stencil. I've chosen where to place the stencil on my pullover and I've fixed it with pins. When you start coloring the stencil remember to put a cardboard sheet inside the pullover to prevent the fabric dye from coloring through the back of the sweater. Be careful, it's important to always apply color on the stencil inward to keep the edges of the letters clean (I suggest to use a little sponge). Once finished remove the stencil and wait for the paint to dry (refer to the information on your fabric dye for the appropriate amount of time). In the end I've decided to cover a part of my quote which I've colored with a fabric dye with bump effect with a yellow sewing thread for a super 3d effect!! You can also decide to use the sewing thread to refine the letters' edge.